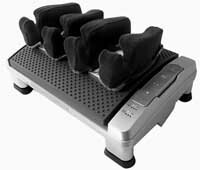 Foot Soother Elite Foot Massager with wireless remote control - With the Foot Soother™ Elite, you will experience the most soothing foot massage possible. A signal from the unit to the remote allows wireless control of your massage. With the Foot Soother™ Elite, you will experience the most soothing foot massage possible. The Foot Soother™ Elite is part of the Interactive Health line of distinct Human Touch™ Massage Devices. Our engineers and designers are proud of the industry advances they have made with Human Touch™ products, and this is no exception. A convenient, built-in incline bar allows you to adjust the unit for chairs and lounges of varying sitting heights. There is no right or wrong combination. Full adjustability simply ensures the pleasures of a luxurious foot massage. 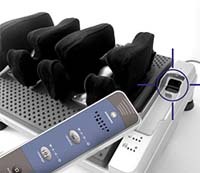 The wireless command remote control allows you to adjust many combinations of vibration and massage to pamper your feet. 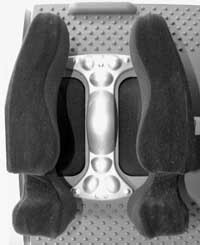 The Massage Pods are designed to conform to contours of each foot, leaving no surface unattended and allowing ample clearance for the tender ankles. The dual purpose remote takes control of Foot Soother when locked into the base socket or conveniently held in your hand.Point controller at the receiver lens when selecting or adjusting functions. Caress and soothe tired aching feet with compress and release action. Press once to activate massage cycle on high setting. Press again to toggle to low cycle speed. Press again to toggle to automatic program mode. Press a final time to stop massage mode completely. The foot massage of your life is just a button-push away!